A conversation with astronomer Lindy Elkins-Tanton, Principal Investigator. Forget about science fiction! 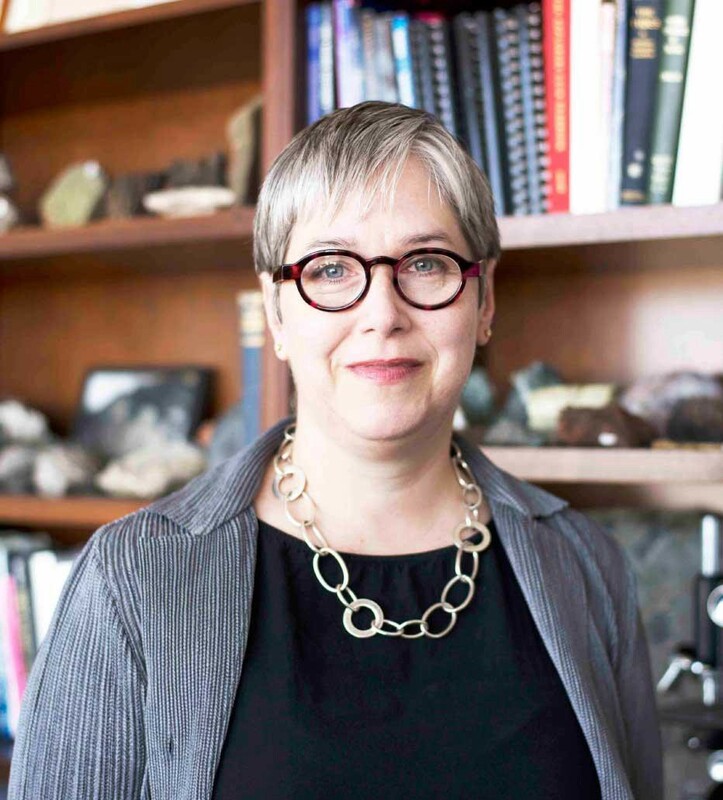 * There’s a new mission that’s going to a truly alien place, a world made of metal, possibly the inner core of a planet — a true journey of “genuine exploration and discovery”, according to Dr. Lindy Elkins-Tanton, Principal Investigator of Psyche Mission. The target is asteroid 16 Psyche. Orbiting in the outer region of the Main Asteroid Belt between Mars and Jupiter, 16 Psyche was, as its name indicates, the 16th asteroid ever discovered and one of the biggest, with a diameter of 200 km and a very high density. 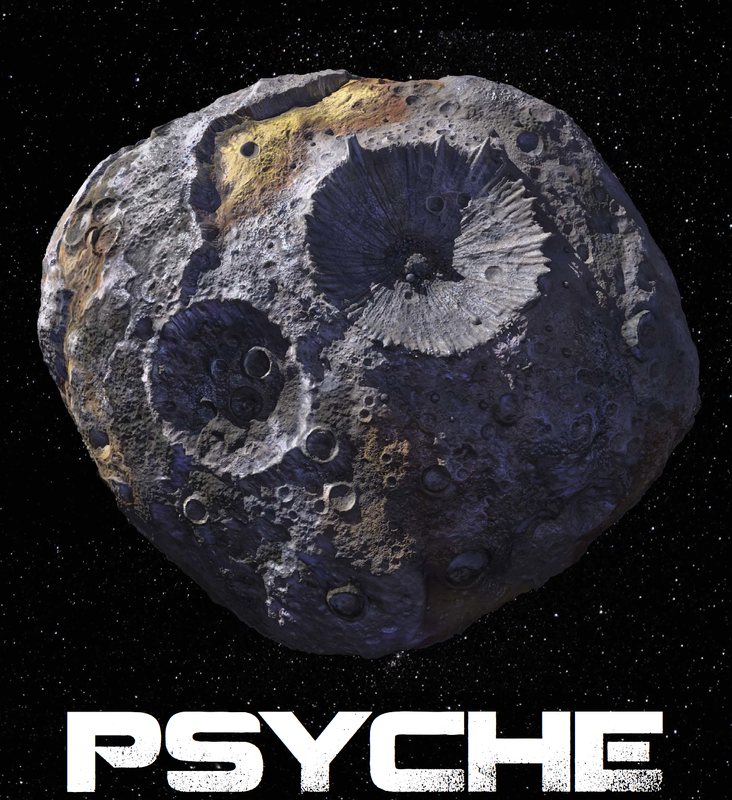 Named after the Greek deity of the soul, Psyche is a unique world, made of iron and nickel, unlike the other asteroids, made of rock, dust and ice, visited by our previous missions. 16 Psyche is, most probably, a planetary core, stripped in the violent childhood of our solar system. 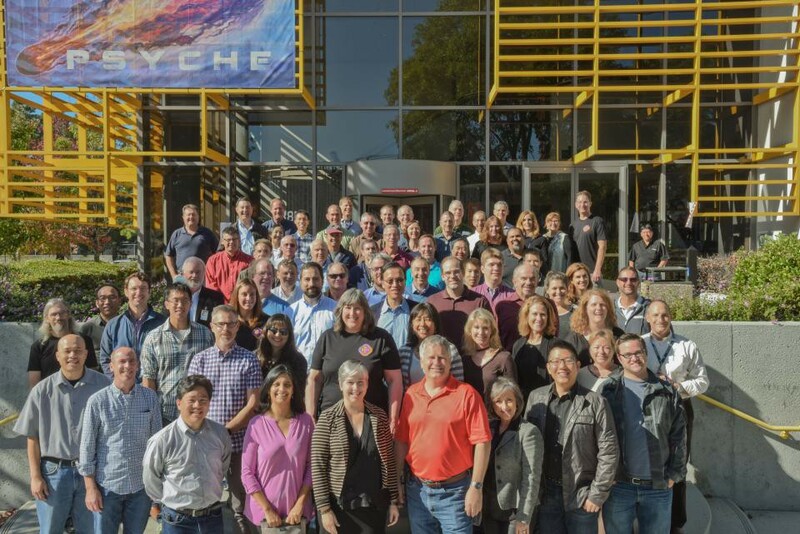 So Psyche is a sort of time-travel mission mixed with a ‘journey to the center of the Earth’, that excites lots of astronomers around the world. 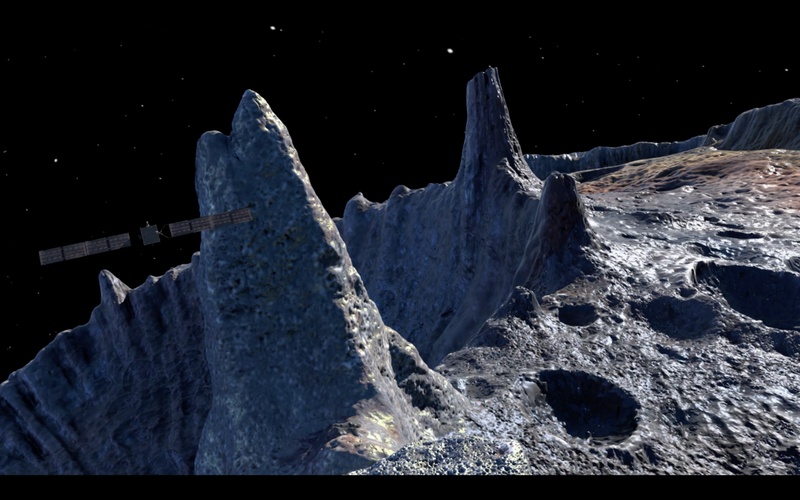 Even NASA seems very eager to see this asteroid. The agency approved the mission this spring, then moved the launch to an even earlier date than before, to the summer of 2022, with a planned arrival at the main belt asteroid in 2026 — four years earlier than the original timeline. 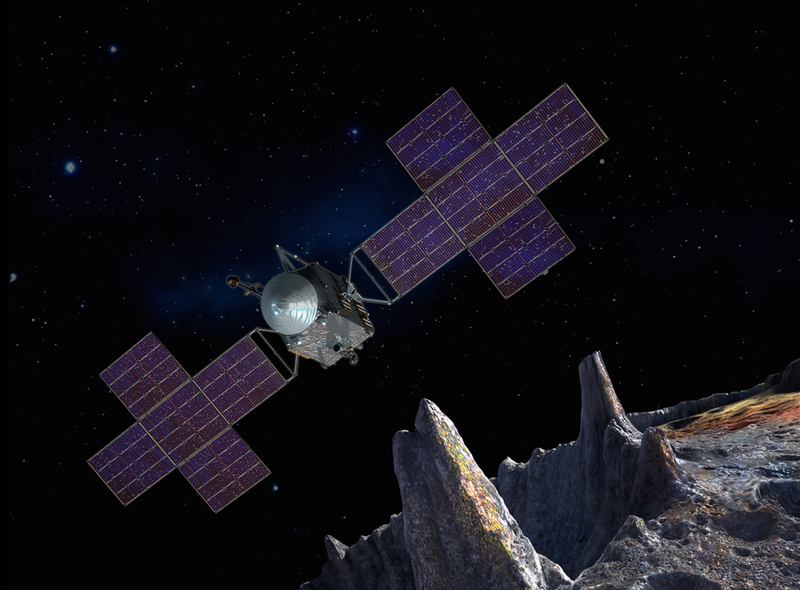 “We challenged the mission design team to explore if an earlier launch date could provide a more efficient trajectory to the asteroid Psyche, and they came through in a big way,” said Jim Green, director of the Planetary Science Division at NASA Headquarters in Washington. As ‘space amateurs’ and space exploration fans, we are also coveting the imaging treasure this mission could bring to our phone or laptop screens. So we really had to talk to the Principal Investigator, Dr. Lindy Elkins-Tanton, Principal Investigator of Psyche Mission. Speaking from her office at Arizona State University, where she’s also director of the School of Earth and Space Exploration, Dr. Tanton shared her enthusiasm about exploring this strange world (and the rest of the solar system or even the future) in a long and extremely interesting conversation (she’s a really cool astronomer! ), which is now yours to read, share or publish — all our articles are published under a Creative Commons licence. *Sorry about that — we’re big fans of good SF, but this mission is really awesome! If you enjoy our interviews, you can now pre-order Adventures in the New Solar System, the best space bookazine of the year! And don’t forget to sign up for our must-read newsletter! The Lunarians: Congratulations on your mission being approved! You and your team were working on this proposal for several years now and we hear the competition in the NASA Discovery Program is very tough. So what makes Psyche such an attractive target? Why do you want to see it up close? There are many reasons. The most, somehow, heartfelt reason is that we’re talking about really genuine exploration and discovery, because humankind has never visited a metal world before. This is the only large spherical metal world in our solar system. 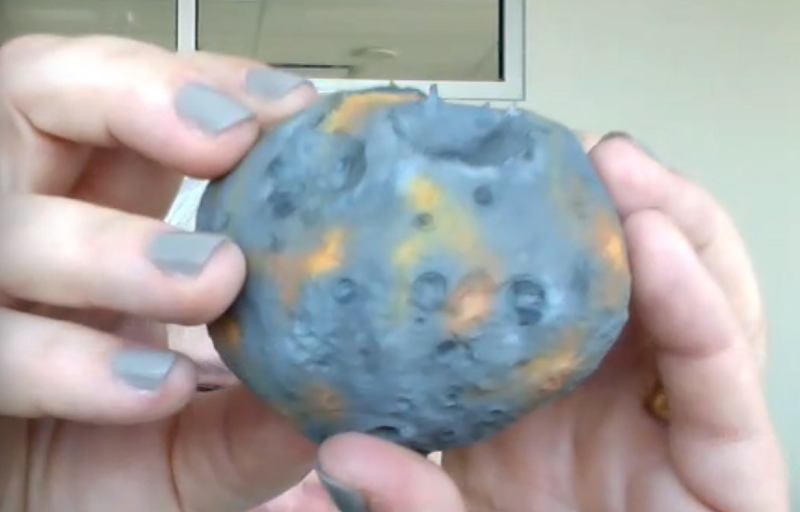 There are other smaller, metal asteroids, but they have degenerate shapes, like Kleopatra or little scraps of things. This is the only one that really could be the core of a differentiated body. And that’s our primary hypothesis for what it is: that it’s the metal core from the inside of an early planet, one that was hit destructively in the early collisions in the solar system, many times — and never hit constructively, so it didn’t build up to make a planet. Instead, it was broken apart and had its rock stripped off its exterior. And so Psyche is a very compelling target, first of all because we get to see a metal world for the very first time. And also because it’s the only way the humankind will ever see a core. 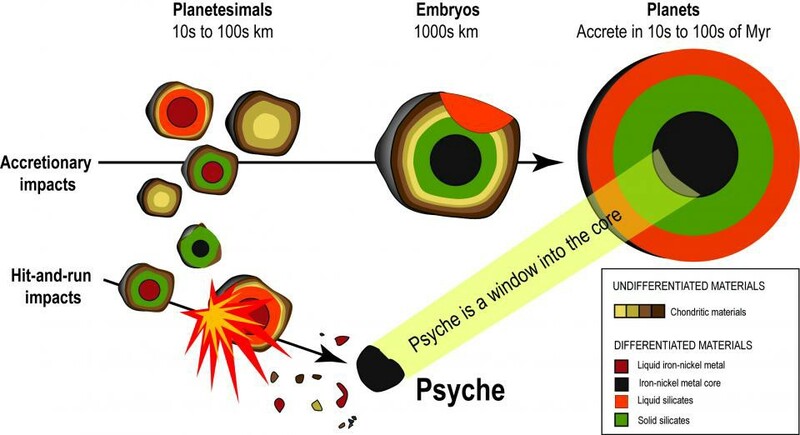 We’re never gonna go to our Earth’s core or to the cores of the other terrestrial planets and if indeed Psyche is a core, as we suspect that it is, this is the only one that we’ll actually see. There are a lot of reasons to want to go there, to understand what’s deep inside our planets today, to understand what was being formed very early in the solar system. You get to use several metaphors, like “back in time” and “to the center of the Earth”. How big is Psyche, actually? The latest radar shape models (Sheppard, 2017) suggest an effective diameter of 226 km, plus or minus 23 km. So effective radius is 113, plus or minus 12 km. And they also find that the overall bulk density is 4500. These number come from radar returns from Arecibo, so, necessarily, they are not the final answer. We hope to get the final answer when we’re there. You have a suite of great instruments onboard. I think so, yes. We are flying dual imagers, so we’re gonna get stereo topography. And each imager is multispectral, they have a suite of filters, so we can look at a number of different wavelengths. We’re also flying two magnetometers in a gradiometer configuration on a beam, so that we can subtract out the spacecraft’s magnetic field. And we’re flying a gamma ray and neutron spectrometer from Applied Physics Laboratory to get the composition. 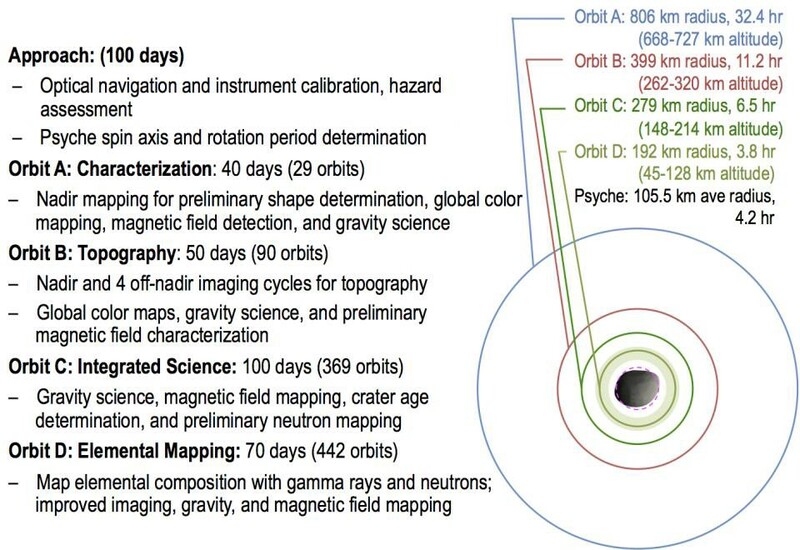 Those are the three major instruments and then we’ll do gravity science using the spacecraft in the usual way, with Doppler interactions with the radio waves. And then, finally, we’re intending and hoping to fly a technology demonstration of a deep space optical communications system that will communicate between the Psyche spacecraft and the Earth at distances out to 2 or 3 AU using laser. The new model of the Psyche spacecraft, with a five solar panels architecture. Right now, Psyche is a speck of light in telescopes. But you have great high-definition cameras and you’re gonna go really close in, almost to 100 km. above Psyche. That’s right, we want to get inside one radius of the body. That means we’re going to enjoy some great images from this mission. I hope so! That the goal. I can’t wait to see what it looks like! That’s going to be the most amazing thing ever. In 2015, New Horizons surpassed our wildest expectations with those incredible images! Would we be surprised the same way with Psyche? I think it’s always that way. Every time we send a mission somewhere, we’re surprised completely — and New Horizons is a great example. There were not very many scientists who thought that Pluto was probably still hot, still a living planet, so to speak, and so there were few people that were able to say ‘I told you so’… The rest of us were completely shocked and amazed by those ice mountains. What a gorgeous place! I hope that Psyche will surprise us as well. Well, we built up a whole suit of scientific hypotheses about how we think a stripped off metal core would freeze. We think it would freeze from outside inwards and that if it was spinning then it would make a magnetic dynamo with this spinning and cooling liquid iron-nickel metal of its interior. And, also, if it froze from the outside in, it could record its magnetic field in its freezing exterior. And we think that the outside would have to break along big faults and shrink because as the inside is freezing it’s gonna lose seven volume percent as it goes from liquid to solid and so any sort of outer shell that’s formed is gonna have to shrink to accommodate the interior shrinkage, so we expect to see contraction scarps, maybe we will see sulphur, immiscible sulphur liquids being squirted out onto the surface. We’ve made a little model (that I’ll hold up for you to see). It’s the actual shape of ‘Sheppard 2017’ shape model. Then, on top of that, are features that we think that we might see. Like, for example, in the shape model it shows a mass deficit in one location and we’ve assumed that it’s a crater and we’ve made some idea that it might have metal kind of frozen turrets. We image that the crust would have broken and slid along. We’re making these hypotheses, but we don’t know... We might end up discovering that Psyche is in fact not a stripped core and that it’s something quite different, which would be very exciting. One thing I say when I give public talks is that I expect that everything that I’m telling you now, all of our best build upons, physical and chemical models, are probably wrong and that we’re gonna see something quite surprising and different. I think so. I think that’s what exploration should be about. You have some pretty talented illustrators, because the images and animations are very nice. But we hope the actual images will be way better. You’re competing with icy bodies, but you have metal, which may shine in more spectacular ways..? 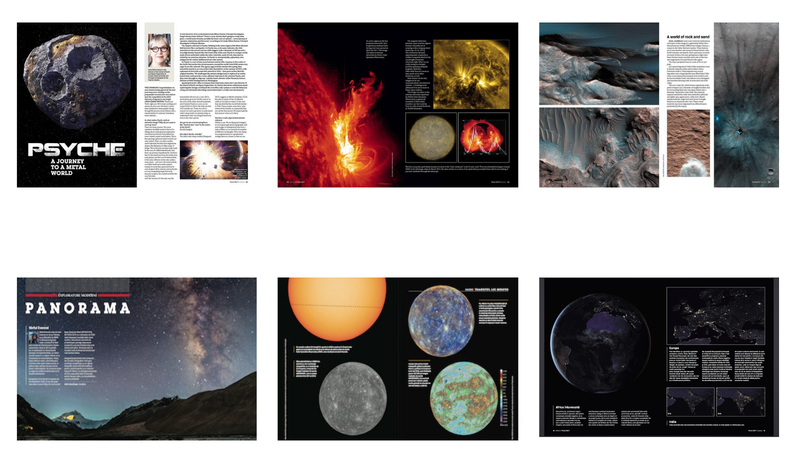 We’re talking from the perspective of the general public, which devours these new spectacular space images. Yes, images are everything. And we don’t know what to expect. We don’t know if it’s going to be shiny, we don’t know if space weathering will make it shine less or make it shine more, we’re not sure. It’s going to be a surprise. One of the things that we’re going to invite the public to do in the years coming up to encounter is: Send us art depicting what they think a metal world is going to look like. And then we will actually have a jury to pick winners. So we all will have to flex our imaginations. I think a lot of people will send you art — like now with Juno mission. It’s a very interesting subject. I think so too. I really looking forward to that. It’s one of my favorite things. 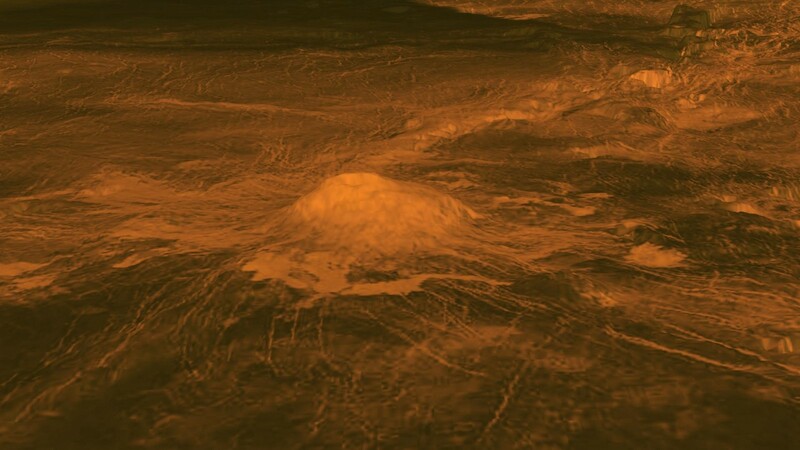 It was also recently announced that we’ve discovered volatiles on Psyche’s surface. It means hydroxyl, it means OH bonds, and so our suspicion is, and the study author’s suspicion is, that these are later impactors of primitive chondritic meteoritic material that would bring water with it, bound into its crystals, that smacked onto the surface and then leaves the water signature. According to our hypotheses, if Psyche is indeed the stripped core we would not expect it to have endogenic water, water that came from within itself, we would expect it to be added from the outside. But we’ll see. It would be, I think, a really wonderful future target for human resources if we find that it has both metal and water. Today, we can only imagine how Psyche could look like. But 2026 is not that far! I just started watching it, yeah! It’s a great show. So now we’re not afraid to ask you what you think about this scenario of (rather near-) future solar system colonisation and the recent buzz around asteroid mining. I definitely think it’s in our future. And we have a big initiative starting up here, a pan-university initiative at Arizona State, called ‘Interplanetary Initiative’, looking at, becoming, let’s say, part of the thought leadership about the future of humans in space. Because it takes not just the science and the engineering, and not just the national space programs, and not just futurists — well, Kim Stanley Robinson’s book 2312 has a very, very wonderful image of what it might be to live in the asteroid belt — But it takes all of the disciplines in between, it takes policy and law and it takes social science and psychology and it takes sociology and all these other aspects of the human endeavour to make a space future. And so we’re working on a big interdisciplinary initiative around this idea. And thinking about these kinds of space futures is definitely a part of it. We’re starting a project this summer that will run all of next year around creating hypothetical human habitations on another body and in fact Kim Stanley Robinson is coming to work with us on that. These things, they’re not actually fantastical, they are rushing towards us. In Europe, we have Luxembourg, serious about investing in such enterprises. And most ‘space companies’ are from the US, which also aims at legislative changes to allow this to happen in the future. So we get to ask, with a straight face, who owns Psyche? (Laughs) Yeah, right now it’s just a joke, but could be a problematic question… You know, I have a graduate student right now, named Kevin Hubbard, who came from political science, and he is working on human behaviour in response to resource scarcity. What happens when different nations or different groups of people are competing for the same resources and then how can we take what we’ve learned from examples on Earth and start to apply it to space law and space policy. Because space law and space policy are sadly, sadly outdated and, sadly, lacking in creativity and nuance around what we’re actually gonna need — these things are not addressed. And I worry that…. I wish that we could create a world of great diversity and inclusivity, but what I anticipate is that if two countries are not getting get along well on Earth I don’t see any reason that they will get along better in space. So I think that we need to start working on this right now. Space, as the saying goes, is hard. And really expensive. So maybe we’ll need to collaborate. Maybe what will happen is people who are colonising Mars for example will bond together in a way that instead will come back … that bond will reflect back on Earth and cause us to do better here. (Laughs) I think if you’re not a little bit of an optimist then you should stay at home and be quiet. I think being a pessimist and being a cynic is lazy and simple. But if you want to drive toward a better future you have to believe there is a better future to drive toward. That’s why we (you) invest decades in a project. Yeah, it’s gonna drive by Psyche in the end, they say around 1,000 km from it. That’s right. I think that, for a long time, a number of people in positions of power in spaceflight were a bit dismissive of asteroids, kind of thinking of it somehow like a sort of stamp collecting. You know, there’s five hundred thousands of them, and you just gonna look at one and you then look at the next and then another one and it’s not gonna really add anything to the overall picture. But we’ve understood now that these small worlds, as NASA now prefers to call them, which is more respectful (laughs), really have a tremendous amount to offer us, helping us to understand how planets come to be and what are the dynamics in the solar system. And also future resources. These are all very important questions and I love the fact that we’re now visiting more of them and learning more. And with the Trojans in particular, like Psyche, these are a kind of body that we don’t understand and we haven’t seen and we don’t really know what they are going to be like and that’s especially wonderful — to really not know. 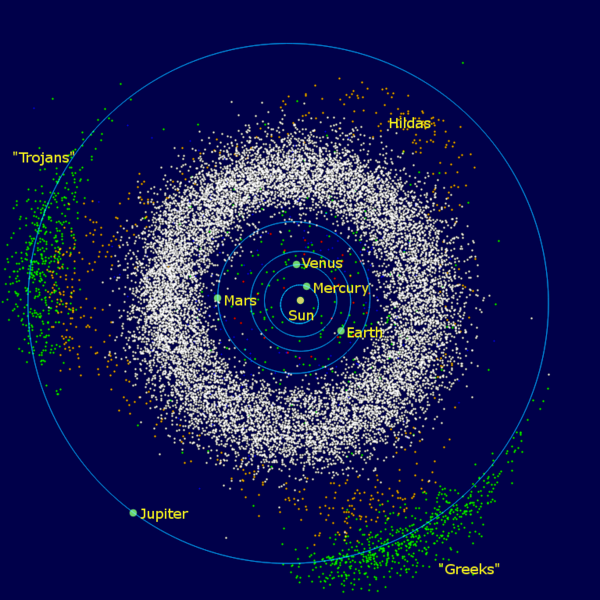 The Main Asteroid Belt is the target of nascent space industries. What do you think you’re going to discover? What do you want to find out? First, if it’s really a planetary core. We want to see the relative ages of areas on its surface by looking at craters, to perhaps begin to understand the process of it being stripped, if indeed that is how it was formed. We’re gonna look at, more technically, the oxidation state of the core, and also what elements besides iron and nickel have been incorporated into the metal phase, and those go right to questions about how cores are originally formed on planetesimals and therefore what kinds of cores are mixed together to make the cores of our larger planets. And then finally the big open question is what is the topology of a metal object. How right or wrong are we about these scarps, and what kinds of forms are there on the surface, and what is the regolith like. These are questions that go not just to curiosity and to understanding formation processes but also to future exploration. Before you can image going and trying to land on a metal object you got to know what the surface looks like. And so we’ll be working on that as well. How rare is Psyche, as asteroids go? I think there are between 10 and 15 asteroids that people would generally agree are metal asteroids. But there are these M class, now called X class, asteroids that have… their spectra, their reflected spectra, seen from Earth, are very flat, very featureless, and so they were grouped together because of their featureless spectra. And one of them is Lutetia, which we visited, and it does seem to have a rocky surface and so there could be different reasons why their spectra would be flat and so not all M or X class asteroids are metal. With Psyche, the clincher for the metal is not just its high density but more importantly how radar signals interact with the material itself, in a way that could only be metal. The total number of metal asteroids is not known, but there are not very many, as far as we know now. We read your article in Scientific American (December 2016 issue) where you wrote that textbooks might need some revisions on the formation of the solar system. What would Psyche bring to this discussion? I think that as we look at the cratering record on the surface of Psyche and as we discover whether or not it truly is a core, I think that it’s going to offer information on how early and rapid all of these collisions really happened, on how quick were the first embryos really formed. Because our Moon forming impact appears to have been fairly late in the planet forming process, we don’t have a tremendous amount of timing information on the buildup of the planets themselves. Our dynamical models indicate that it takes between four and eight hit-and-run impacts, destructive impacts to knock the rock off of a planetesimal to make a completely or relatively bare metal core — and when these cores are run over and over, most solar systems end up with no bare cores because, you know, it’s about half and half wether an impact would be constructive and accretionary, or destructive and hit-and-run. So if you have to do five, it’s like flipping five tails in a row and never getting a heads in the history if the solar system, and some of the simulations end up with one Psyche, every once in a while with two, but it seems like a pretty rare occurrence and if we could confirm that Psyche is a core and that’s how this was formed then it’s gonna tell us something about how quickly all the planetesimals interact and are finished, either built up into planets or flung into the Sun. So I do think that this is gonna add quite a bit to that story. In the process of becoming amateur astronomers and ‘planetary fans’, we used your series on the solar system from the 2000s. What revisions should you make to those texts now? Unfortunately, I’m very unlikely to ever revise those books again. They went through one revision already and now the particular editor I’m working with is moved on and so I think that that particular series is gonna fade into the past. But New Horizons, yeah, that’s the first one… amazing changes there. I think probably the biggest news is all the geysers on the ice moons, the increasing likelihood that those would be good places for life. What you need is a way to change the physical energy of a body to biological energy. And generally that’s some kind of disequilibrium in the organic chemistry, for example fresh rock brought up against salty water, that hasn’t weathered away yet, that give us source for potential chemical energy that life could use. And so you need a body that’s still living, so to speak, and that has, ideally, an interface between liquid and fresh rock, renewed rock, and so these places that have geysers, Enceladus and Europa, and moving on through the solar system, those are very likely places and I think that’s one of the big things that has to be added to the story - the many new places that could support life; and then the question is Did life ever start there? What would you visit if you won another mission, or even more, have an unlimited budget? 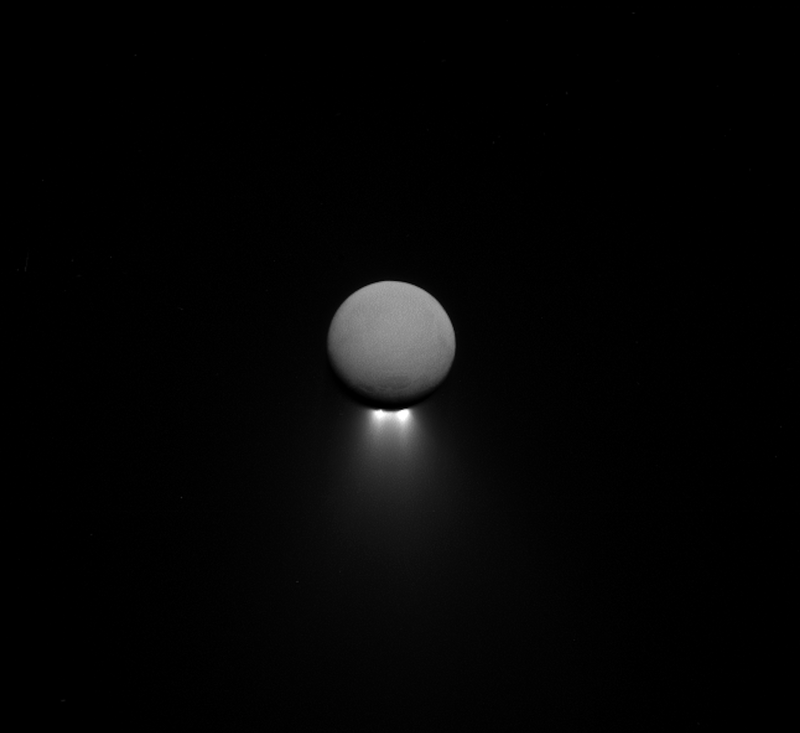 Enceladus’ intriguing south-polar jets, viewed from afar, backlit by sunlight while the moon itself glows softly in reflected Saturn-shine. If I could have a dream mission, I guess it would be one of two things — and I’m just gonna talk about a dream mission here, not one that’s actually affordable, or even that we have the technology for — but one of them would be to go to Enceladus and drill through the ice and get samples of the water and bring them back. That would be amazing! That would be hugely changing of our understanding of the solar system. And the other one would be to go to Venus and get selections of the surface material from a number of different places around Venus and bring them back. Because, still, that fundamental question of why did the Earth go one way and Venus go another is unsolved, and as we look out into the solar systems away from our own and we say that a planet is or isn’t in the habitable zone we know we don’t know that — and it’s so misleading, you know, because you don’t know it’s a Venus or an Earth, it depends on its composition and its history and we don’t have the way to know that yet. So those are two mission I would really love to do. Venus was kind of ignored in the last years… But it seems that several agencies are interested in missions to Venus. Oh, my goodness, they were incredible. And even today we can barely figure out how to stay on the surface longer than they did. And so it’s gonna take a very big mission to do that and that would be a great way for us to do a big, international collaboration, to send a meaningful flagship mission to Venus to really push the science forward, not just hack away at it and do an increment. Coming back to asteroids, and smaller budgets, maybe the future will bring more partnerships between state agencies and private companies. I hope we do get to that and I’m really looking forward to seeing what happens next and I think the key for all of us is to keep the sociology and the politics moving forward in a positive way while we look at this future of humankind. You made your plans for Psyche in 2012, it would get there in 2026. That’s a lot of years to wait. How do manage this kind of investment, in plans, career years and fear, knowing that space is very often extremely ruthless with our exploration plans. Bad things can happen, yeah. I think this is one of the risks, obviously, of trying to do longterm, big term projects in any field, the risk that you would’ve put your all into one thing and have it fail. For me — first of all, we actually started in 2011, so we have even a year more — part of it was that I was really not expecting to win. We created an unusual proposal in that we had a brand new partner, Space Systems Loral, who’s never done a deep space flight before, and so we weren’t sure that NASA would accept a new partner. We needed to demonstrate what a good choice they were. And also they gave us a firm fixed price for building the spacecraft, chassis and the propulsion system. Normally, every spacecraft of this magnitude is built in a custom way, it’s a one-time off build, and so all the NASA cost models are created that way and when they try to check to see whether the cost that you claim it’s gonna cost is a reasonable cost… we knew we would break the cost model, because Space Systems Loral builds a lot of them, you know, they have more than 80 of these things flying in geostationary orbit around the Earth doing communications. They know exactly how to build it, they know exactly what it’s gonna cost, and so we were not sure that NASA would accept that, but they did, we were able to back it up to the point that it was completely acceptable, which was great. We made all these decisions, which we knew were the right decisions for the mission, but we thought would probably make it very unlikely that we would win - also people were saying it’s Venus’ turn, that Venus mission are going to be selected - and so few missions are selected the first time through, it’s very rare to be selected the first time through the process. So for me the key was to build up a team of people who I really enjoy working with (that’s incredibly critical) and make sure that we are learning things all the way along, so that all the steps of the proposal are really worthwhile, because it’s a learning experience, we’re producing new science, it’s all positive. Winning at the end of all that was just a surprise and it was so welcoming and exciting, such a privilege, but process itself was worthwhile. And then in terms of waiting and waiting to get there, luckily this isn’t the only thing that any of us are working on and we all have additional passions and additional visions that go along side this. Yes, I think that we would all be completely devastated if something happens, but we all know that it’s possible. It could be anything, from a global crash in the economy and a cancelation of the program, to a failure, God forbid, of the spacecraft, and so we know we have to be a little bit ready for that and part of that is recognising and accepting that risk and having other things also on one’s plate. But is easy to say before it happens… If it happens I’m sure it’s going to be harder than I imagine. One of the key things about having a deep passion in your life is that your personal life and your work life are not so differentiated. People ask me all the time ‘How do you balance the work life and the home life’ — and, personally, it’s a bit of an annoying question because men don’t get asked that very much, usually women get ask that question, so it comes with all of these assumptions that go with it, but for me the answer is that I don’t have two different lives, I have one life and it’s all the things that I do, and it includes my husband and my son and it includes walking in the desert, reading books and it includes doing science and teaching people and giving talks and all those things are just a part of life and end up together and to me that is just a happier life than one where I try to make a partition between one side and another. You’re also an expert in a doomsday scenario, one with scary volcanism, and also a passionate voice for protecting the environment. Every astronaut and astronomer and space engineer we talked to was a passionate advocate for environmental protection. What makes you, as a profession, even though you’re focused on things way out there, to care so much about ‘down here’? It’s an interesting question. I think about that a lot. I think about what is needed on this Earth in order to help humans better understand how to keep ourselves happy, which is really what it comes down to, because indeed the Earth is really gonna be fine and life of some variety has survived through hotter periods. It’s we who haven’t and our societies can be deeply disrupted — are already disrupted! — so the question is how to help humans understand how to tackle a problem and move forward in a positive way, rather than to feel helpless, rather than to feel disenfranchised or only feel anger. Why not feel some agency?, that’s what I would hope for. And I think after decades of thinking about this I actually feel that this is what’s needed, I think it’s not …. of course, we could use more hospitals, we could use better healthcare, we could use clothes, food, these things that people need, but fundamentally what we to need to be successful as a species is that we have to take responsibility for ourselves. I think it comes down to education, how do we learn to recognise a problem that needs a solution, to understand that we can participate in finding that solution, to know how to take steps forward. And that’s what we are trying to do here at this University, learn how to prepare people for the future in those ways. As a result of this also, my husband and my son and I have started a tech start-up around software that we think helps people learn better as they learn, it’s called Beagle Learning, and it’s for online assisted learning, and so I think that all these things come together: on one hand you can say ‘here is human suffering and there’s a speck of light in the sky’, but I think that what we need is to be better humans. And part of being better humans is to be curious, to be driven, to use our exploring hearts. And I think the real purpose of all space missions is to encourage everyone to take a bolder step their own lives, to imagine they could do something bigger than they thought they could, braver than they thought they could, something that they can drive forward. I think if everyone felt that way, we would be doing better as a species. That’s how it all comes together in my mind. 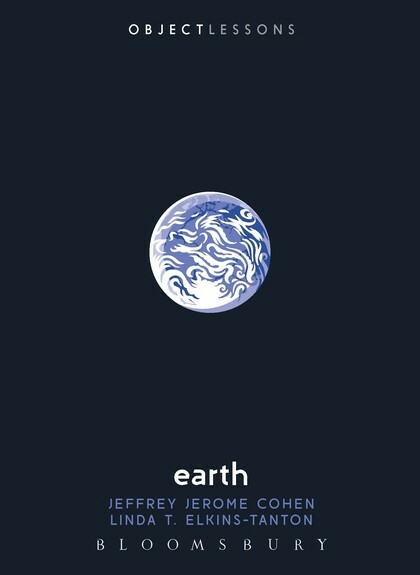 You also have a new and curious book, called Earth. I really love this little book. It’s a collaboration between myself and a professor of English at George Washington University named Jeffrey Cohen. He’s a medieval scholar. Some years ago, we were asked to do a plenary talk at a conference together. I studied rocks and he studied rocks, in a sense — he spends a lot of time thinking about the place of rocks or stones in the lives of humans. And so they thought it would be interesting to have people talk about the same material, from two different points of view. At first, we were both very skeptical, not sure that we would really understand each other (it’s amazing how different specialised language is, you can’t even begin to understand what the other person is trying to say), but what we discovered was actually a very fruitful conversation. And so, in the end, we more or less had that conversation again, this time in the form of the book. What we’re doing is we’re discussing the way humans think about the Earth and also leaving the Earth and looking back at it from space, from the point of view of history, back to the Greeks — I learned through Jeffrey, people dreamt of flying off of the Earth into space and looking back at the Earth and seeing it as a sphere, before there could be any dream that there could be technology that would enable a person to do that. There’s something in us that makes us wanna go and look. And our relationship between ourselves and our planet is really a very fraught relationship between damage and worship and between value and wishing to leave. This is the conversation that we have in this book. (laughs) That’s right. Actually, it’s already happening, at a lot of universities we’re working on collaborations with private space companies. In fact, we’re gonna have a workshop here, with 15 or 20 private space companies coming and talking with us about research that we’ll do together. But the question is what’s the business model? A lot of business models were for sending satellites into near Earth orbit. Then, when you go past that, when you want to go out, what is the business model? Throughout history, exploration has mainly been around commerce, it’s been about finding a new market or a new path to a market you know about, or mapping an area so you can sail there more safely. It all has to do with commerce or empire building, which is a larger form of commerce, I think, and so science was always just tagging along, it was just an add on. And these big missions, like New Horizons, like the ones that go out to Saturn, they are really driven by science, they are not driven by commerce and so the question is what is the business interest in that or is that truly only a national activity? (laughs) I think that’s true, you can do it as an ego exercise, absolutely! 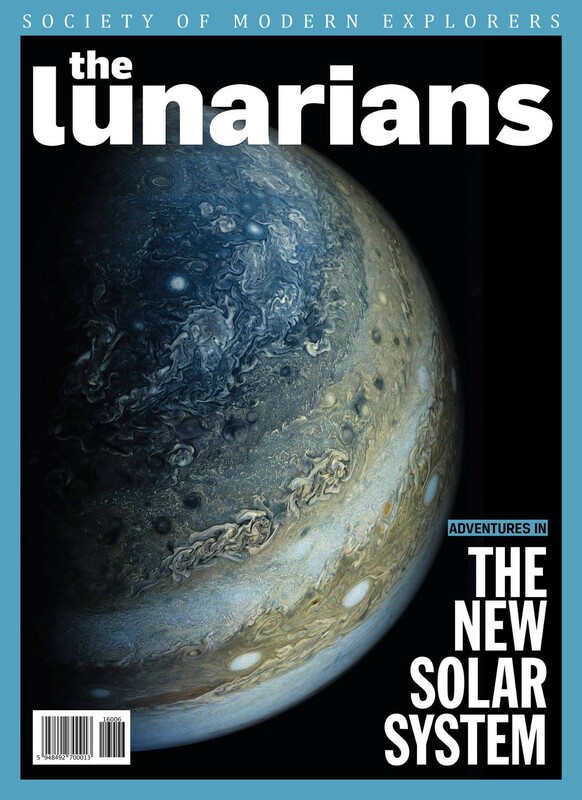 Featuring some of the best recent images streaming from Earth’s fleet of robotic explorers and lots of interesting interviews with astronauts, astronomers and engineers from all the current and future missions, Adventures In The New Solar System is the best space bookazine of the year! Pre-order now to be among the first to enjoy over 350 pages, printed on quality glossy paper, with great layouts and even better content! And sign up for our must-read newsletter. Science journalists, future space tourists. A new journal of space exploration.